Uber executives continue to grapple with a host of challenges, but that hasn't put the brakes on the company's futuristic — and somewhat outlandish — plans to develop a network of flying taxis. The project gained a bit more altitude at Tuesday's kickoff of the two-day Uber Elevate conference in Los Angeles to discuss urban air transportation. Uber's high-flying venture comes against the backdrop of terrestrial problems, from taxi industry pushback in cities such as London to political fallout due to a self-driving car death in Arizona. The San Francisco-based ride-hailing service announced new partnerships with government officials and aviation manufacturers aimed at further developing electrically powered vertical takeoff and landing aircraft, or eVTOL for short. 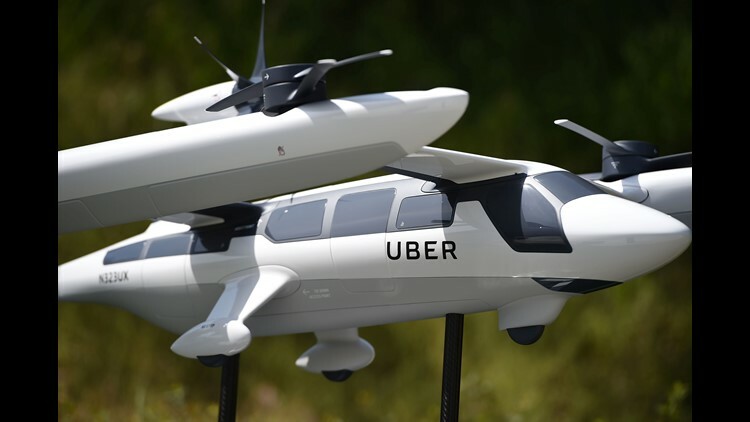 Uber's air taxi would use wing-mounted propellers to provide lift, as with a helicopter, and a tail-mounted propeller to generate forward thrust, as with a plane. "There's no magic or huge leap of science that needs to occur here," Jeff Holden, Uber's chief product officer, said in a live-streamed keynote address. He asserted that helicopters aren't the answer due to noise, emissions and safety concerns. "There's amazing headroom to improve on urban mobility," Holden said. Uber has targeted 2020 for eVTOL demonstrations in Dallas, Los Angeles and Dubai, the first three cities to partner with Uber on flying taxi feasibility and infrastructure studies. A commercial fly-sharing network would begin in 2023. Called UberAir, the proposed service recalls the opening images from the 1960s cartoon The Jetsons, where people fly around in car-like vehicles that land in dedicated docking ports. Uber said it has entered into real estate partnerships with Hillwood Properties and Sandstone Properties to develop such sky ports. Uber is far from alone in trying to crack the code on a new form of transportation that leverages electric power to beat increasing urban density. A range of companies — including Virgin Hyperloop One, Aurora and The Boring Company — are delving into hyperloop-type solutions, which shuttle people and vehicles in above- or below-ground tubes at high speeds. Uber says eVTOL craft will be capable of cruising at up to 200 mphr at heights between 1,000 to 2,000 feet. They will travel 60 miles on a single charge and can recharge in five minutes. The actual flying vehicles will be developed by Uber engineers in partnerships with established aircraft manufacturers such as Bell, Embraer and Aurora Flight Services. Uber announced an updated Space Act agreement with NASA officials to study air-traffic control issues inherent in low-altitude passenger flights. Using the Dallas area as a guinea pig, NASA will analyze if eVTOL operations would trigger traffic-collision advisories. The company also released revamped sketches updating images revealed at the first Elevate conference in Dallas last year that show a new technological development: a pair of stacked co-rotating propellers, which Uber says will make the ride quieter. Uber announced it will be working with the Army Research Lab on the new system. And, somewhat shockingly, the rides in these crafts would "eventually, after several years in the market, cost the same as an UberX car trip of the same distance," according to Uber. What remains unsaid is how Uber and its partners would manage the regulatory challenges in creating a vast network of low-flying aircraft in urban centers, especially considering that a smaller version of this vision — drones — has yet to take hold in U.S. skies. And even if the political will for eVTOL travel does develop, public acceptance of both riding in such a craft or walking beneath one would need to emerge to justify investing billions in the venture. Uber's efforts in the flying vehicle space come at a time when the company is trying to right itself after a series of corporate scandals — ranging from accusations of a sexist work environment to pursuing programs that skirted the law — that led to the departure last year of its co-founder and CEO Travis Kalanick. In March, Uber's self-driving car program took a hit after one of its Volvo autonomous cars hit and killed a pedestrian in Arizona, an incident that has led to the state's governor revoking Uber's ability to test alongside rival Waymo, which started as Google's self-driving car division. While some reports have suggested that new Uber CEO Dara Khosrowshahi has been hesitant about the company developing its own self-driving car technology, he seems to be supportive of Uber Elevate. Khosrowshahi is scheduled to address the Elevate conference Wednesday.